There has been plenty of reportage over the past few months about Linkin Park vocalist Chester Bennington joining Stone Temple Pilots, but little has been written about how his main band remains in full swing — on not just one album project, but two. "While I was working with Stone Temple Pilots on their new EP there were some times I was actually recording with Linkin Park the same day," Bennington told Yahoo! Music. "Writing for both was crazy — but it was fun, too, because both bands have their own distinct character." On August 10 Linkin Park debuted the new song "A Light That Never Comes," a collaboration with turntablist Steve Aoki, who took the stage with them during the performance. "Steve and I met up like a year ago, maybe more," Linkin Park co-vocalist Mike Shinoda said during a Q&A with fans. "[The song] happened pretty organically, just shooting ideas back and forth." "A Light That Never Comes" will not be on the upcoming Linkin Park album, the band’s management said. Nor will it be featured on the soundtrack to the film Mall, which is being directed by Linkin Park keyboardist Joseph Hahn. The movie stars Vincent D’Onofrio, Gina Gershon, Peter Stormage, James Frecheville, and Cameron Monaghan, and is based on the Eric Bogosian novel about five unhappy suburbanites who become inextricably entwined one night when Frecheville goes on a shooting spree in a shopping mall. Hahn has started shooting the film, but there is no scheduled release date. Linkin Park are creating the soundtrack with help from Deadsy drummer Alec Püre. While a few songs will feature Bennington's recognizable vocals, much of the material is instrumental. "There’s a different mindset going into scoring a movie than making a record because you're trying to capture the scene without having the music distract you from what you’re looking at," Bennington said. "We’re trying to capture the emotional quality of the film, so there's a lack of structure and there aren't very many parts when compared to radio songs. Also, there are different characters in the movie that require different threads of sounds. So there's a lot of cool elements we’re working with." In early August, Bennington finished recording vocals for a five-song Stone Temple Pilots EP that will come out in the fall. 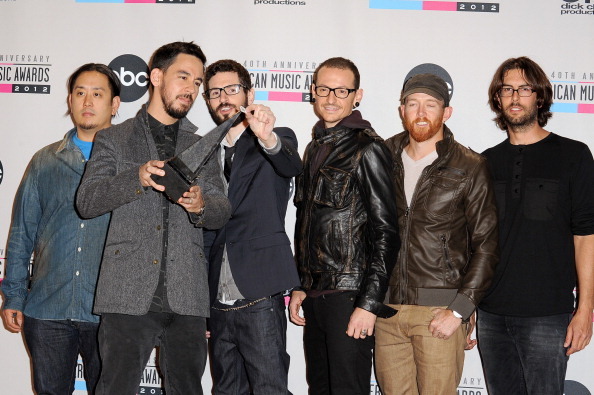 There is no scheduled release date for the follow-up to Linkin Park's 2012 album Living Things. But Bennington insists that regardless of how much fun he has with STP, Linkin Park will remain his main gig. "I love Stone Temple Pilots, but I’m in love with Linkin Park, and that's a great position to be in," he said.